Few plants hold their flowers as gracefully as fuchsias. Whether large or small flowered, the blooms typically tremble at the end of fine wiry stems. How I enjoyed unceremoniously popping the balloon-like buds of the varieties we grew in our garden when I was a child. They deserved better treatment. I have always found fuchsias utterly captivating and easy to grow, although over the years my tastes have turned away from fat, ruffled doubles towards slender, elongated singles. 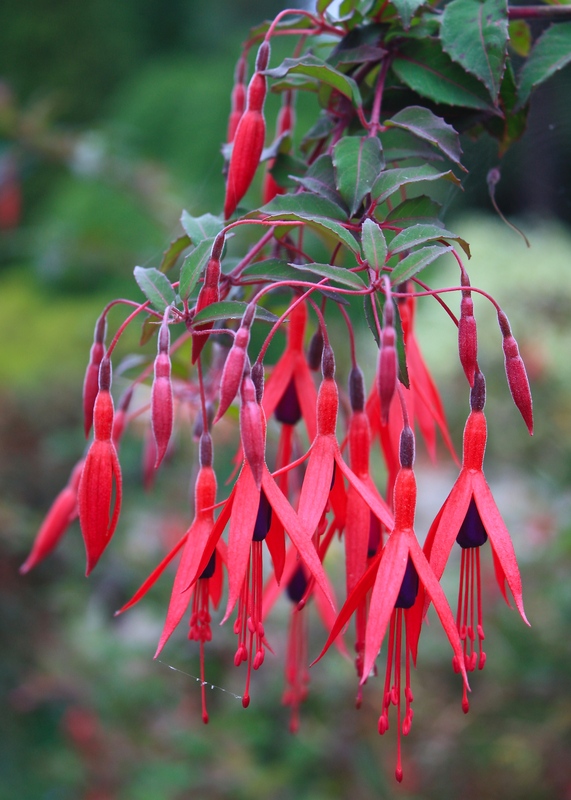 I have trifled with F. triphylla and F. speciosum and flirted with F. boliviana and F. arborescens, but when one encounters a well grown specimen of Fuchsia magellanica var. gracilis none of the exotics are a match for its sheer poise and elegance. A hardly species, Fuchsia magellanica var. gracilis is often overlooked because it is, in a word, common, especially so in the south and west of England near the coast. Here in moist, sunny climes, it forms floriferous hedges in gardens, occasionally making a foray into the wild. It’s a shrub that deserves more than a second glance, especially in September when the flowers, with all the poise of ballet dancer, fall so graciously from the tips of the arching branches. Beautiful – the colors are so dramatic.